This is the fiesta ham we had last holidays and we love having them several days of that festive season. This delicious ham from Purefoods can be served with lettuce, mayo, salsa and cheese sauce. It can also be a hawaiian style or Aloha with pineapple wedges and teriyaki sauce. 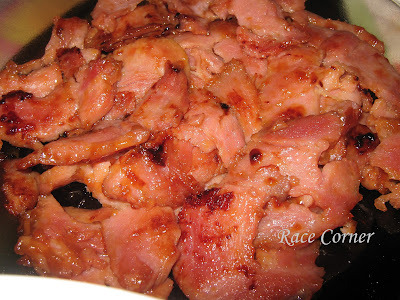 You can think of several ways on how to serve and enjoy this yummy ham. I prefer the above picture which is our own way of having it for breakfast. Mom just fried it and it's ready for our stomach. Actually I love it most with sandwiches and tomatoes. i wish all my life there is a chicken or fish ham. possibly ba yan? I love to put mayo in my ham. because ham is already fatty, i don't fry it. just heat it in pan without oil or in a microwave or turbo. i miss our pinoy hams. Btw, I have an ON-GOING giveaway... Hope you can join. Thanks!